Get ready to kick your Artist Shop up a notch with Bucketfeet shoes! These stylish slip-ons are a great addition and have a specific file set-up. But don't worry, we're here to walk you through the setup requirements. All shoe files are REQUIRED to use one of the shoe templates below. However, they can be used with any program that can edit a .PSD file. Photoshop is recommended, but programs like GIMP can be used with the template. Tileable patterns or repeating designs are the easiest to work with because the same art file will be used for all shoe sizes. A red Bucketfeet logo patch will be attached to the heel of each shoe. A black Bucketfeet logo will be printed on the insole of each shoe. Shoes will have a cyan outsole with a white Bucketfeet logo. The product preview in your Shop will use the middle sized template for the shoe mock-up. If you making a new product with just shoes, you will still need to upload a Master File as a design preview. As mentioned before, all shoe sizes will use the same art file. The printed design will be cropped and sewn based on size. Because of this, you can see both the smallest (Womens size 5) and largest (Mens size 13) printable area of both with the dotted lines on the template. The art file should be set up to cover the entire area of the template including outside of the "safe" printable area to add as much padding as possible. 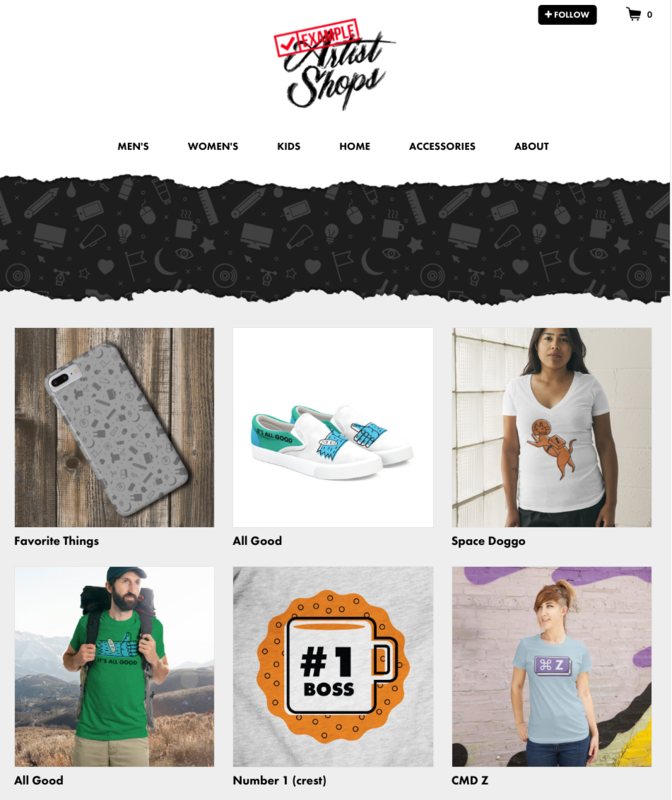 Check out the templates and mockups below for three different art layouts. 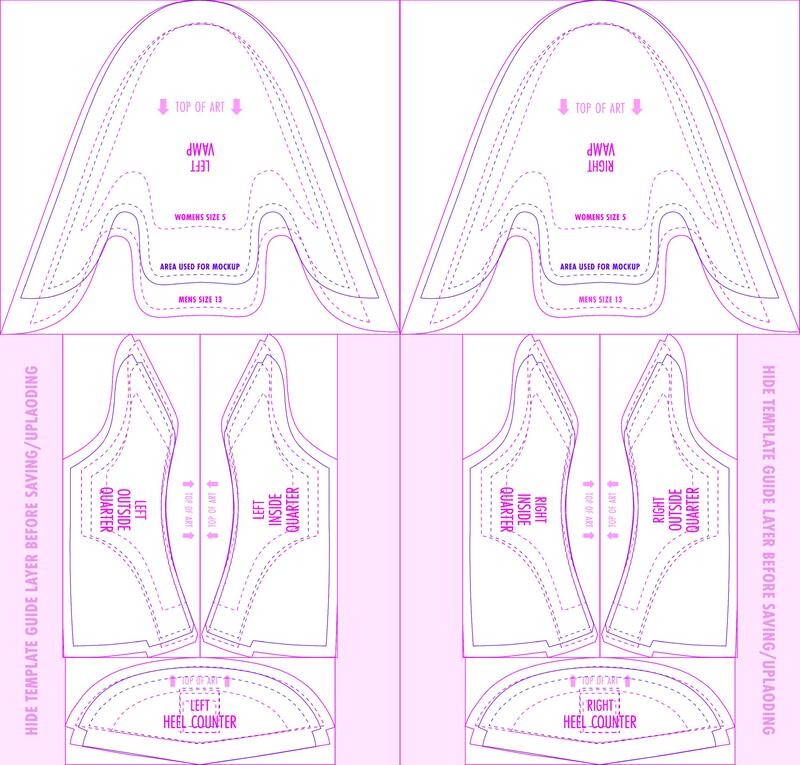 Once the template is uploaded, can select the binding color (a single visible strip of fabric connecting the shoe’s sides to the tongue) and if they will be seen in the Mens and/or Womens section of your site. You can also add them to existing designs from the Products overview page of your dashboard. Note: When adding to existing products you'll need to activate shoes under both Mens and Womens sections. However, you'll only need to upload the file once. Now that you've added Bucketfeet shoes to your Shop don't forget to update your Homepage collection!